Canadian artist Andrew Jackson’s first CD is enormously varied but still there is a red thread running through it. The opener March The Equinox is a short, classic lo-fi track that reminds me of Guided By Voices. This is followed by more rocking material. Eugene Nix is rather Sixties oriented, with parallels to the Rolling Stones. Another retro track is Enough Blood To Keep ‘em Coming which could also have been by the White Stripes. The album feels like an exciting rollercoaster ride where you never know what to expect around the next corner. Mother Nature is a swift rocker that lets Mando Diao look pallid in comparison. This is contrasted by the gloomy ballad Another Day Of Misery which reminds me of Glenn Danzig. More hit appeal and accessibility can be found on Grinder, while So Much More shows parallels to Midnight Oil. The last two tracks add a certain blues touch, and even some noisy components. There are no truly extreme parts to be discovered here, but the many comparisons show that a very broad spectrum of rock has been covered. 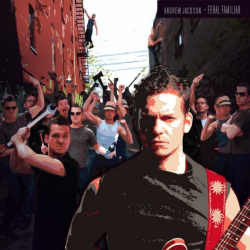 Andrew Jackson comes out as a very talented musician who is at ease in many different styles. Rather unusual is the fact that there are four songs less than a minute long that may risk going under among the longer material, but they certainly don’t disturb or distract. Feral Familiar has become an album that should be a wonderful addition to the collections of every fan of first rate rock music.